You may click on the photos to enlarge. The Florida Super 8 was a great show with tough competition! *Congratulations to Pamela Prentice with "Sayes Who"
job with numerous firsts as well. *Congratulations to Christina Alexander and "Shameless Pleasure"
January 2- WISHING EVERYONE A SAFE, HEALTHY AND WEALTHY NEW YEAR!!! Congratulations to Dr. Ted Zajac and "Stop and Stare"
Congratulations to Christina Alexander and "Shameless Pleasure"
Congratulations to Brooke Moore and "Zip-N-Tumble"
Congratulations to Lexi Moore and "Luke Absolutely Me"
accomplishments and a successful trip to the "Last Chance Show"
held in Myakka City, Florida. "CANT PASS ME BY" Best of luck with "Teddy"!! and the horses are getting a little time off. 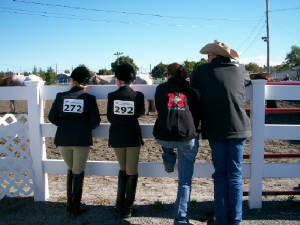 November 5- Check out the World show on the "2011 World Show Results page. Oct 13-14 Congratulations to Christina Alexander and "Shameless Pleasure"
Oct 1-2 Scenes from the cold, cold north. GSAA October show. Tulsa with her new friends Katie, Sam, Gracie, Christina & Ashley. Tulsa and Mom, Dad's in the trailer with football. Good friends Gracie, Christina, Seattle and Will ready to show in the cold and rainy NJ!! * Congratulations to Pamela Prentice and "Sayes Who"
September 12- Congratulations to Christina Alexander and "Shameless Pleasure"
August 22- Congratulations to Christina Alexander and "Shameless Pleasure"
Lexi Moore - Reserve Hi-Point Walk/Trot with "Zip-N-Tumble"
Brooke Moore- Reserve Hi-Point Youth 14-18 with "Zip-N- Tumble"
mare with Heather. Owned by the Mignosi's. Point Halter Mare w/ 3 Grands and 1 Reserve. Owned and shown by John. * Introducing "Jessie Cook" the newest member of the HRSH team. wins in the Non Pro HIH. Jessie Cook and "Who's Next"
"Enchanted Paradise" Best of luck to Vicki and "Lucy"!!! What a great pair they make. *Congratulations to Pamela Prentice and "Enchanted Paradise"
"Tell Me Why" Hi-Point Halter Horse- Great job Debbie & Kara!! "That's one beautiful cowgirl !!" $2000 to assist Jamie and his family. ** Congratulations to Jess Olsen-Groome Hi-Point Non-Pro. 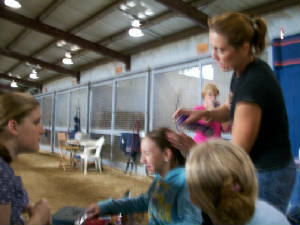 ** Congratulations to Pamela Prentice and "Sayes Who"
earning numerous wins in Showmanship and HUS. give aways. Can't wait to return to Venice. "Pretty Zippy Hotrod" hi-point youth 13 & under. **Congratulations to Jess Olsen-Groome hi-point non-pro. champion HIH mares first time out. 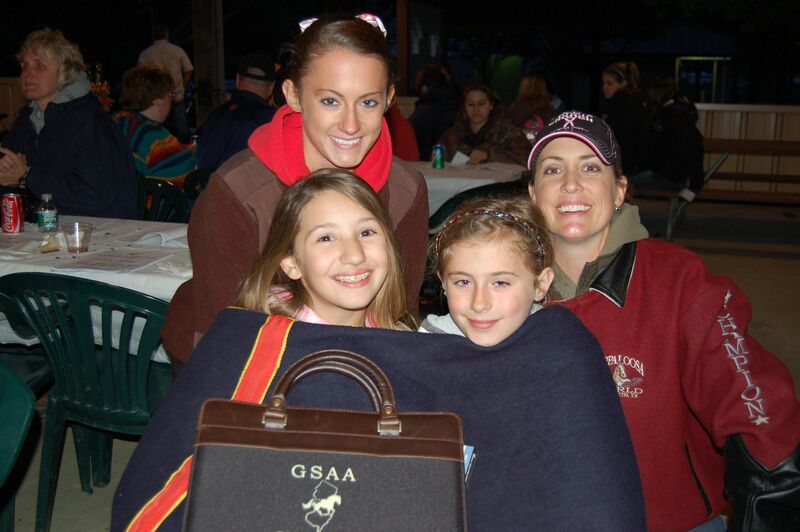 wait to get them to Florida and their first horse show experience. go show. John has completed work on his "retirement home"
hopefully he'll get back to keeping the site updated. Think Spring!! November 30- Home from a very enjoyable trip to Florida. and they had a very productive show in Bushnell. hats "cleaned & creased" ! all the news from Ft. Worth. 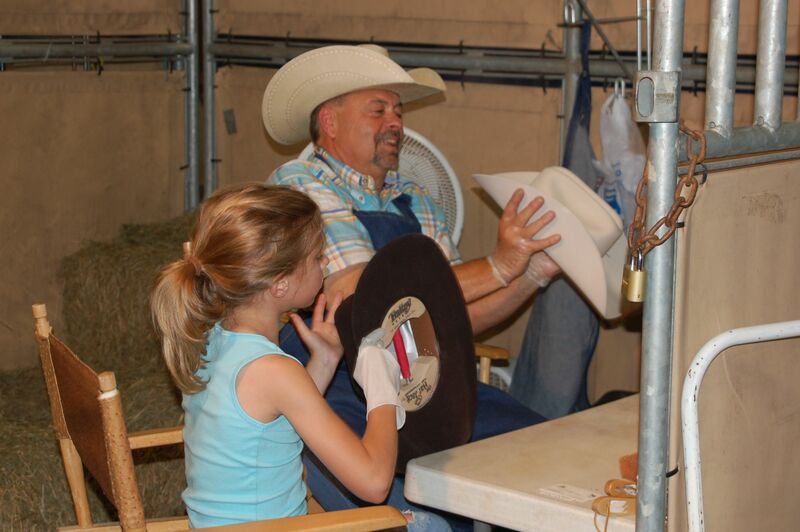 13 & Under at the 2010 NC State Fair Show!!! "Sayes Who" on numerous wins at the NC State Fair!! Grand Champion Mare at the 2010 NC State Fair!!! 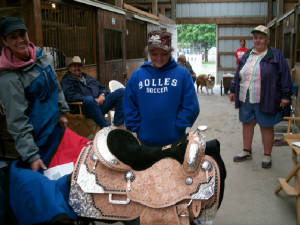 October 4-** Congratulations to Kara Kaufmann and "Pretty Zippy Hotrod"
Mom & Dad - a new Harris saddle, what a surprise!! ** The costume contest was a real sucess! Thanks to everyone who visited "The Taco Shop"
Zippy Hotrod" HI POINT YOUTH 13 & UNDER!! "Shameless Pleasure" HI POINT NOVICE YOUTH!! 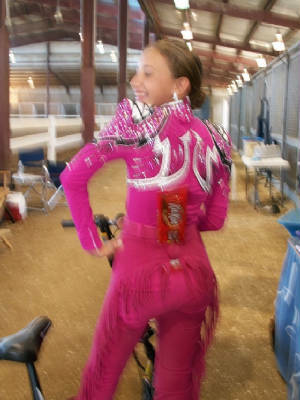 ** Congratulations to Brooke Moore with "Zip-N Tumble"
great show in WALK/TROT events!! 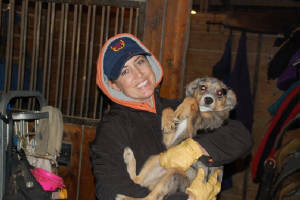 *Congratulations to Kara Kaufmann and "Pretty Zippy Hotrod"
show short to return to NJ for school! and Reserve Hi Point NP Masters!! Also "Sayes Who" Hi Point English Horse!! * Congratulations to Christina Alexander and "Shamless Pleasure"
Hi Point Novice Youth 18 & Under!!! next appearance in Ft. Worth! All the girls had a great show in Branchville!! 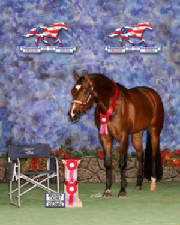 * Congratulations to Kara Kaufmann & "Pretty Zippy Hotrod"
reserve hi point youth 12 & under at The Reichert Celebration. looking forward to returning for the 2011 ApHC Nationals. 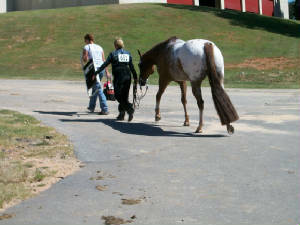 "Horses Sold", "Horses For Sale" and the "2010 Nationals Show Results"
pages for the latest news. Congratulations to Kara Kaufmann Hi-Pt Youth 13 & under, KAC Overall Hi-Pt member and overall Hi-Pt Youth , receiving the KAC Trophy Saddle!! Congratulations to Brooke Moore Reserve Hi-Pt. Youth 14-18!! Congratulations to Lexi Moore for a great show in Walk/Trot events!! Congratulations to Pamela Prentice and "Sayes Who" for a great show. "Sayes Who" and Heather 3 First and 1 Second in 3 yr old HUS!! 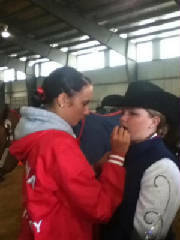 Congratulations to Jess Stockinger for a great job in showmanship and halter events!! 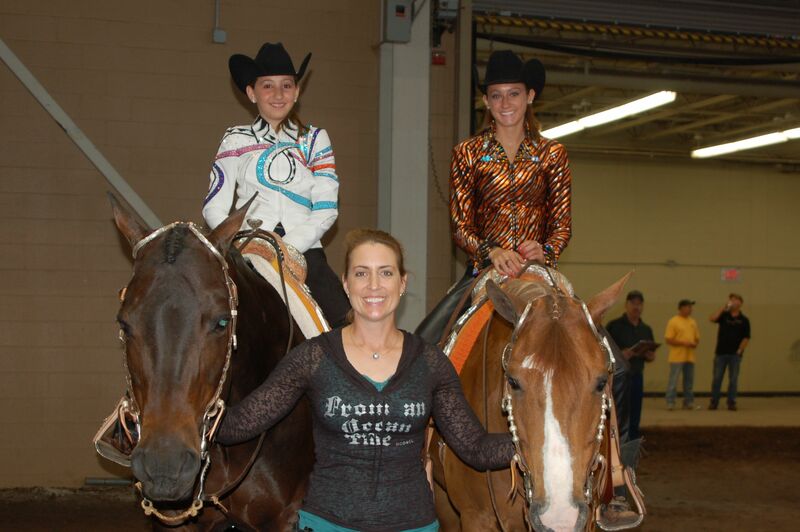 Kara Kaufmann & "Pretty Zippy Hotrod"
It was great show for all the girls!! Sleep was at a premium. 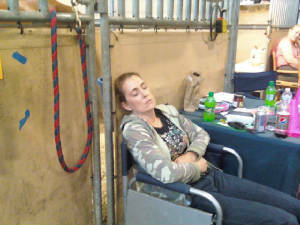 The little "apprentice" Lexi and John cleanin & shapin @ "The Taco Shop"
We managed to wake her up @ 1:30 AM for Horsemanship. When you are this tired you will sleep anywhere! 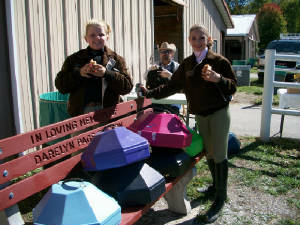 13 & Under and Reserve Hi Point Performance Horse - Quad-A-Rama Findlay,Ohio. Look for Pamela, Kara, Brooke , Lexi and Jess at our next stop- Harrisburg,PA. May 28-30. May 10- ** Congratulations to Brooke Moore with "Zip-N-Tumble" & "Luke Absolutely Me"
High Point Youth 14-18 @ Delaware Spring Fling. High Point 35 & Over NP @ Delaware Spring Fling. 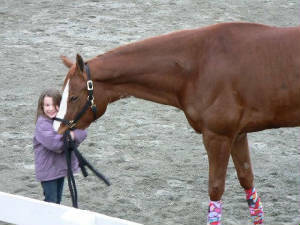 **Congratulations to Lexi Moore with "Zip-N-Tumble" winning in Walk/Trot events @ Delaware Spring Fling. ** We all missed you Kara! 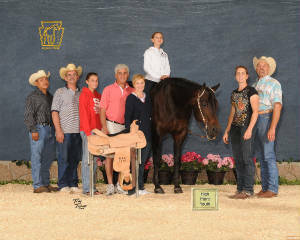 judges and High Point Halter Horse at the PAHC Southern Hospitality Show. four judges- first time shown at the PAHC Southern Hospitality Show. Clemson,SC is a great one and we look forward to showing there each year. and recipient of the "Spring Louie Memorial" perpetual trophy. 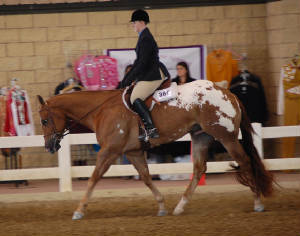 *** Brooke Moore and "Luke Absolutely Me"winning in HIH and HUS . Brooke Moore and "Zip-N-Tumble" winning in all around events. 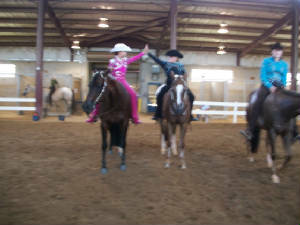 *** Lexi Moore and "Zip-N-Tumble" winning in Walk/Trot events. Banquet held on a "frigid Friday" night. Great job girls!!! It was a cold evening @ the GSAA Banquet. 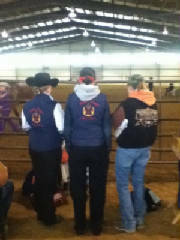 together,winning in Showmanship and HIH. "Sayes Who" was also Reserve High Point Champion in halter geldings. of a really cool scooter!! Award at the Florida Super Eight Show in Venice, Florida. "This Way N That" 1st 3 Yr Old HUS- Now a "SILVER MEDALLION"recipient- Congratulations Lou & Marilynn Feuerstein! "Enchanted Paradise" Reserve Open Aged Halter Mares- Congratulations to the Mignosi Family! 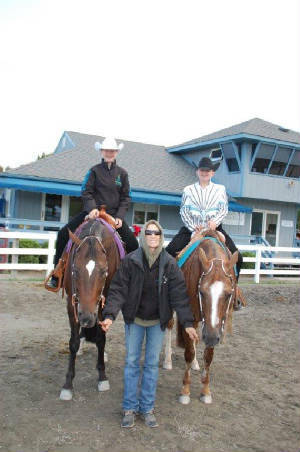 Western pleasure 12 & under, Keyhole 13 & under. Stump race 12 & under,Versatility 12 & under with "PRETTY ZIPPY HOTROD". with "Hands Off My Hunter". with "Luke Absolutely Me" . 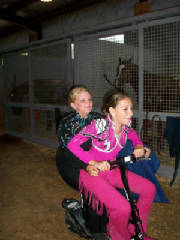 riding "Enchanted Paradise", Kara was also named High Point Youth 13 & Under at the NC State Fair Show. Congratulations Kara! What an accomplishment! We are very proud of you!! Grand Champion Gelding by all judges at the NC State Fair Show. Exhibited by Steve Bennett. the Reserve Hi-Pt Youth 14-18 at the Delaware Autumn Extravaganza, Harrington, DE. Youth, Lee Jackson Classic, Lexington, VA.
Congratualtions to Jess Stockinger Reserve Hi-Pt Youth 14-18, Lee Jackson Classic, Lexington, VA.
August 24- Congratulations to Kara Kaufmann Hi-Pt Youth 13 & Under and Hi-Pt Novice Youth, Harrington,DE. August 17- Congratulations to Kara Kaufmann Hi-Pt Youth 13 & Under and Reserve Hi-Pt Novice Youth, Branchville, NJ. Hunter In Hand Geldings, Branchville,NJ. 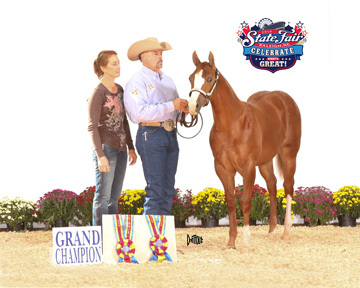 Dr. William Smith Memorial Trophy by being selected the "Champion of Champions Halter Horse".